Australian manufacturer, Pioneer Computers recently started the sale of their latest tablet, named ePad A10.The new ePad A10 tablet is based on Intel's Pine Trail platform.The tablet runs on Windows 7 OS and now available for sale with a starting price of $599. 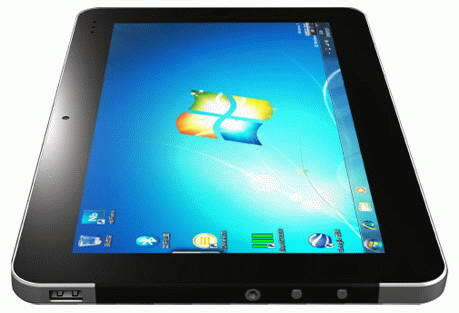 New ePad A10 tablet comes equipped with a 10.1-inch LED multi-touch display with resolution of 1024×600 pixels and is powered with a 1.66GHz Intel Atom N455 or a 1.83GHz Intel Atom N475 processor.The Tablet also houses an Intel integrated graphics card. DreamBook ePad A10 Tablet packs a 3-cell Polymer battery providing 5 hours of battery life.The tablet weighs about 900g and its dimensions are 267×173x8-17 mm. Pioneer Computers DreamBook ePad A10 tablet now available for sale for a price tag that starts at $599 for the basic configuration. Tags:-3.5G modem tablet, DreamBook ePad A10, DreamBook ePad A10 Tablet features, DreamBook ePad A10 Tablet specifications, DreamBook ePad A10 Tablet availability, DreamBook ePad A10 Tablet price tag, DreamBook ePad A10 Tablet specifications, DreamBook ePad A10 Tablet price details, Pioneer Computers, Pioneer Computers Australia, Pioneer Computers DreamBook ePad A10, tablet.